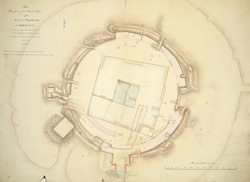 Water-colour plan with measurements of the Stupa at Amaravati, dated June 1817. Inscribed on front in ink: 'Plan Descriptive of the Present State of the Mound of Depaldenna at Amravutty Shewing what has been cleared out and what still remains to be removed. Laid down from actual Measurements. June 1817. The Yellow Color denote stones that are entirely destroyed. The White shew the place of stones that have been removed & are now missing'. The great Buddhist Stupa at Amaravati was discovered by Colin Mackenzie in 1797. It was founded in the 3rd-2nd centuries BC and enlarged in the 1st-4th centuries AD under the Satavahana and Ikshvaku patronage and represents one of the greatest architectural achievement of ancient India. The stupa was a centre for religious activity and worship for hundreds of years and was probably still used by worshippers up until certainly A.D. 1344. Hinduism was the main religion in the country at this time, but there were still practising Buddhists in India. Soon after this period, the Amaravati Stupa fell into disrepair. When MacKenzie reurned to the site in March 1816 he found that many pieces of the sculptures had been reused in local building projects. He began to draw and record the sculptures remaining at the site. In the 19th century a series of excavations took place. Today almost nothing is preserved of this great monument on the site. Large collections of the Amaravati sculptures are kept in various museums.